For many reasons, excavating an open trench to repair drains or replace pipes is not always convenient, desirable or cost-effective. Consider the damage and disruption that might be caused to driveways, lawns and road surfaces. So when do we recommend Trenchless Moling Technology? 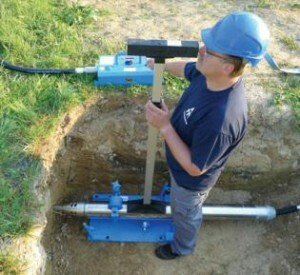 Installing new or replacement water or gas mains, cables and underground service ducts. Trenchless moling is the ideal solution when installing any new service supply pipes under an existing surface material including a block paved drive, lawn, tarmac road or driveway. Costly disturbance or even the destruction of garden features or landscaped surfaces is eliminated. Trenchless Moling Technology can save up to 75% of the cost compared to traditional open trenching methods. Hall Mechanical Services Limited is a registered trenchless moling technology contractor, approved by many Water Authorities throughout the UK. We have built a reputation, over many years and several generations of Hall family members, providing competitively priced solutions and employing skilled and qualified engineers. For us, only the best is good enough which is a philosophy we share with you, our customer. Trenchless Moling – How We Do It to see more information.